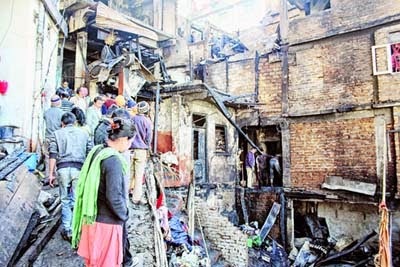 Houses in Darjeeling town Gutted in fire and injured five last Night. According to the Telegraph: Eight houses clustered together in Darjeeling town were gutted last night, the blaze scalding two children among others. In all, five persons were admitted with burn injuries to their faces and other exposed parts of their bodies. No deaths have been reported. The blaze started in one of the houses in the Pound Road area a little after 10pm. Lal Singh Gazmer, 86, his grand-daughter, Anshu, 15, and three members of another family - Sunil Barma, 37, his wife Pooja, 28, and their son Adarsh, 8 - have been admitted to the district hospital with burns. "They have suffered burns mostly on the face and uncovered parts of the body. The burns range between 20 and 25 per cent. Although their condition is stable, we are providing special attention to them so that there is no infection," said Saikat Pradhan, the superintendent of Darjeeling district hospital. Three fire tenders from Dali brought the blaze under control around 1.30am today. Lakpa Darnal said he rushed out of the house when he saw smoke. "We were about to sleep when we saw smoke. We rushed out immediately but could salvage nothing." As the flames spread, at least two gas cylinders are suspected to have burst. "My father There are in Darjeeling municipality maintain that only 7 which located has been only four kilometers , residents fear that heavy traffic along NH-55 can delay the tenders from reaching the spot.In 2008, social organisation Godawari Sangh had demanded that approached the fire officials in Darjeeling to setup a fire station be set up in town after a blaze in following a fire at Pragrati Gram in Darjeeling that year. The In response the Sangh's initiative the director general of West Bengal fire and emergency services wrote has written to the subdivisional officer, Darjeeling, to scout for a find out a suitable plot land to set up a fire another fire station. "... would request him to find out a suitable land or accommodation within the heart of the town of Darjeeling towards setting up another fire station there", the the letter dated 16 June 16, 2008, readhad stated. But there has been no further communication word on the this issue. According to the the statesman: A massive fire that engulfed a residential area at Gaddikhan, Chandmari, in Darjeeling town left five persons injured and nine houses gutted last night. The fire department in the town said they received a fire call at 10.30 in the night. A fire brigade team, police personnel, civil defence personnel, a disaster management team, Army personnel and local people jointly fought the flames. It is learnt that two cooking gas cylinders also exploded in the fire, prompting people nearby to jump out of their beds. “A loud explosion woke me up. Me and my sister rushed out of our home looking for a safe place,” said Souvik Thapa, a resident of the locality. The injured have been identified as Lal Singh Gazmer, 86, Anshu Gazmer, 15, Sunil Prasad, 35, Puja Prasad, 30, and Adarsh Prasad, 8. Some of them are still undergoing treatment in a hospital, where, sources said the condition of Lal Singh Gazmer and Adarsh Prasad is critical. Darjeeling Municipality commissioners T Chettri and Zahid Khan said the fire affected 49 families and that the municipality is making arrangements to provide them relief. Gorkha Jan Mukti Morcha General Secretary Roshan Giri, and Asha Gurung, a GJMM leader and wife of party chief Bimal Gurung, also visited the affected families. Preliminary estimates show that the nine households suffered a loss of Rs 18 lakh, municipality chairman Amar Singh Rai said. Houses in Darjeeling town Gutted in fire and injured five last Night. In all, five persons were admitted with burn injuries to their faces and other exposed parts of their bodies. No deaths have been reported.